The benefits of retrieval practice i.e. the act of having to retrieve something from your memory (often with the help of a cue), in terms of supporting long term memory, have been well documented. Similarly a number of classroom strategies that support this, such as starting each lesson with questions from last lesson, last week and last month and the use of flashcards, are common practice for many teachers. One strategy that is less well documented is Cornell note taking. Devised by Professor Walter Pauk of Cornell University in the 1950s, it is a way of students setting out their notes to support retrieval practice. Furthermore, it requires very little planning and preparation from the teacher – the best kind of new approach. My interpretation of this can be seen in the the diagram above. Students should get into the habit of having three sections to their notes. Whilst the original approach was aimed at helping students to take notes e.g. during a lecture, I have adapted it slightly to fit with what happens in a secondary classroom. I think it works well. The right hand side is used for their normal class notes – nothing different here, just whatever you would normally do in your lessons. Why are hormones referred to as chemical messengers? How are they similar and different to nerve impulses? Name 5 endocrine gland in the body. For each gland, name a hormone it produces. 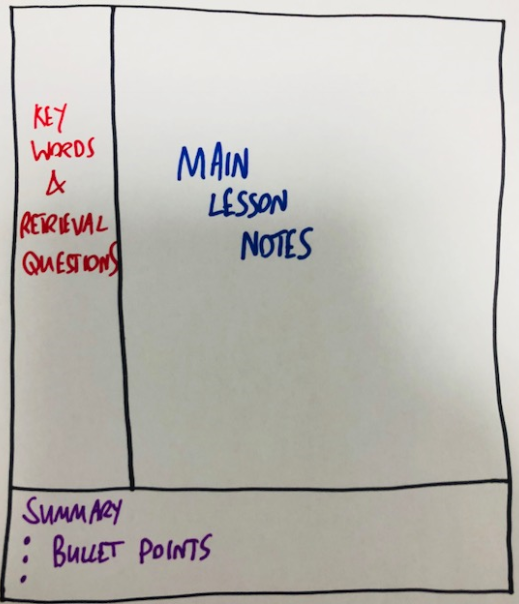 The idea is when they come to revise (a significant time after the notes were produced), rather than just passively re-reading their notes, they go to the left hand column and either try to retrieve the definition of the key words from memory, or answer the retrieval questions. Thus, supporting retrieval practice. This is a far more effective use of their time, compared to simply re-reading notes, which is not very challenging, doesn’t require much thinking and is unlikely to support learning. The final section is for them to summarise the key points of the lesson, in 3 bullet points. This is pretty self explanatory and whilst simply summarising has limitations in terms of supporting learning (see Dunlosky in the ‘further reading’ section below) , this could also be used for self-testing. Students could try to retrieve from memory the three key points from the lesson, write them down, and then check with the bullet points they wrote originally in the ‘summary’ section, if they were correct. In addition to the benefits in terms of retrieval practice this approach supports, it’s also possible that the metacognitive process that takes place during cue and question generation, engages students more in the content being learnt. It’s certainly something I’ll be giving a go with my Y11 group. If you are interested in developing teaching approaches that support long term memory, you might be interested in the ‘Improving Memory’ training programme we are hosting at the Durrington Research School, starting on the 1st October. This entry was posted in General Teaching and tagged Cornell, Retrieval practice. Bookmark the permalink. Just started using this idea with my KS4 students this year too. Early days, but I’m happy with he response so far.